Movie news over the past week has reported that Leonardo DiCaprio and Steven Spielberg have bought the famous ruby slippers from the The Wizard of Oz for the Academy Museum of Motion Pictures, set to open in Los Angeles. The ruby slippers are known as the "witch's shoes" because they're believed to be the pair seen on the feet of the Wicked Witch of the East after Dorothy's house falls on her. Judy Garland is also thought to have worn them in close-ups when Dorothy clicks her heels three times to return to Kansas. Today being Leap Year Day, a pair of ruby slippers - or red shoes - could also be the perfect thing to wear. There is a traditional custom that if a woman wears a red petticoat on February 29 she can then propose marriage to the man of her dreams - as I mentioned on my blog yesterday. Red is a dynamic colour. It is the colour of blood, which is vital for life. It also represents female power, warmth and passion. In the original book The Wizard of Oz by L Frank Baum, the slippers were silver rather than the red colour made famous in the movie. The Wizdom of Oz, an analysis of the spiritual symbolism in the Oz stories by author Philippa Merivale, points out that a silver cord is what is supposed to keep us in touch with our souls if we journey to the astral plane. It is possible to see Dorothy's visit to Oz as being a shamanic journey and silver slippers therefore represent the link to her soul that would help her get home. The switch to ruby slippers implies it is more important for Dorothy to keep in touch with her earthy strengths to get what she wants. The Wizdom of Oz points out: "Red will keep her vitality high, remind her to value her life, stay upbeat, be right here, right now, be a bit physical instead of living in her head, up in her dreamland." These are all good reasons to put on your red shoes this Leap Year Day as well as your red petticoat or anything else in red that you fancy wearing. 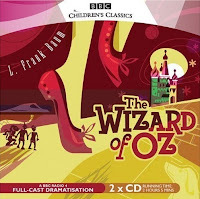 The picture at the top shows the BBC Audio book of the The Wizard of Oz, which you can order through Amazon.